Here you see the full moon calendar with the full moon dates of 1960 and exact times and dates in an overview. 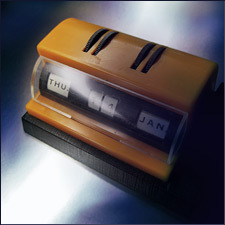 Desk calendar with adjustment wheels, made of plastic, from the 1960s. The first full moon as of 1960 was on Thursday, 14.01.1960. 11.05.1960 – In Buenos Aires, 4 Mossad agents kidnap the Nazi fugitive Adolf Eichmann, who used the cover name "Ricardo Klement"